Our 3/4" Value Line Custom Dice feature your one- to full color custom design on the one side and standard spots on sides 2-6! You can print a photo, words, a logo, or any design you have in mind. Choose from black, green, blue and red dice with white spots and white dice with black spots . 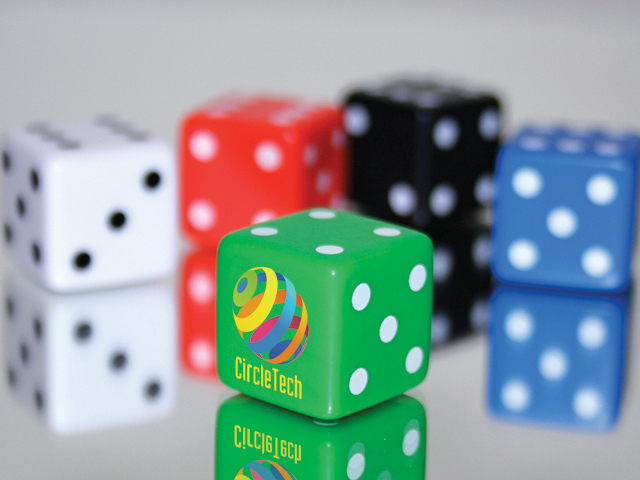 These high-quality and economical Custom Plastic Dice are perfect for tradeshows, giveaways, promotions, and much more. Value Line Promotional Dice are our most economical dice item, with pricing as low as $0.75 (R) per piece. Our minimum order for these low price custom dice is 750 pieces. For Free Value Line Custom Dice Samples and our Promotional Dice Catalog, or for additional information, please contact us. NOTE: For 3/4" Opaque Custom Dice with six different images on the sides, please see 3/4" Opaque Custom Dice.